It's not as if I need another reason to eat chocolate--but this one does sound like a good excuse. Like you said, it's healthy. My daughter loves bananas. I am going to have to try this. Thanks. Oh dear lord...I should not have even come to this blog!lol Man now I am going to have to try this...do you think they make organic marshmallows? Me either. Well thanks for checking out my blog! 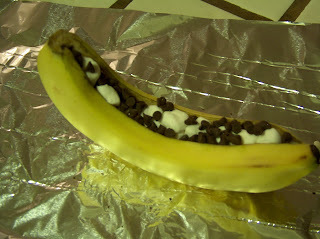 We love bananas at our house, and of course, chocolate and marshmallows, too. Sounds so good. I'll have to try it. Wow, this sounds incredible! My kids would absolutely love it. I have one that is obsessed with bananas! Thanks for letting me know you stopped by my blog! AND, I LOVE the title of your book. Tha sounds like something I would love to read! You are some kind of wizard! I am going to do this at my daughter's upcoming slumber party. We're inviting 12 little girls. Lord help us. I think I'll eat like a whole bunch of these.